It’s 13 years to the day that Thierry Henry became Arsenal’s record goalscorer, when he scored his 186th goal in a Gunners shirt against Sparta Prague in the Champions League. The Frenchman went on to score 228 goals in north London, cementing his status as one of Arsenal’s greatest ever players. Needless to say, Henry scored a number of blinders over the years – so to celebrate the king of ‘va va voom’, we run you through nine of his most stunning Premier League strikes. Our first trip back through the Henry archives takes us to Vicarage Road, and a superb individual strike against Watford in April 2000. Picking the ball up just inside the Watford half, Henry drove at the Hornets defence with his fearsome pace, weaving past two or three half hearted tackles. Fronted up as he got just inside the box, Henry was forced to improvise with his finish – and did so to absolute perfection. Arcing the ball from outside the post, he bent the ball past Alec Chamberlain into the far corner – before tearing off to celebrate in front of the visiting support. Next up on the list is a truly magnificent strike against Manchester City, with Henry showing just how pinpoint accurate he could be. Picking up the ball in treacherous conditions out on the left hand side, Henry cut inside (as he so often did) before fizzing an unstoppable bullet past David James into the top corner. The sheer ferocity of the strike took the ball past the England goalkeeper before he could really move, bringing the house down at a raucous Highbury. The wonderful thing about Henry was that he had the ability to conjure something out of nothing – and that’s exactly what he did against Manchester United at Highbury in March 2004. Having collected the ball around 35 yards out, Henry had only one thing on his mind – firing a long range effort at goal. And what a long range effort it was. Cutting across the ball, his arrowing drive swerved past a helpless Roy Carroll in the Red Devils goal, sending the home fans wild. It was a sensational strike but one that we’d come to expect on a regular basis from one of the Premier League’s greatest ever frontmen. Cheeky, impudent, audacious – all of those adjectives describe Henry’s next goal against Charlton to a tee. Receiving the ball with his back to goal inside the box, it looked like Henry had nowhere to turn with Addicks defender Jonathan Fortune close behind. Henry had other ideas however, outmuscling his foe before pinging a sublime backheel through the defender’s legs and into the far corner past Dean Kiely. A moment of sheer magic and one that defines the style and charisma that Henry brought to England’s top flight. If nothing else, Thierry Henry was a heartbreaker. He scored umpteen late goals over the course of his career, and instigated the vast majority of Gunners’ comebacks from precarious positions. One such occasion was at Upton Park in August 2002, as Henry’s stunning shot helped overturn a two-goal deficit against West Ham. Firing past David James once more, Henry left him groping at thin air – arrowing a cannon of a shot into the top corner from all of 30 yards. 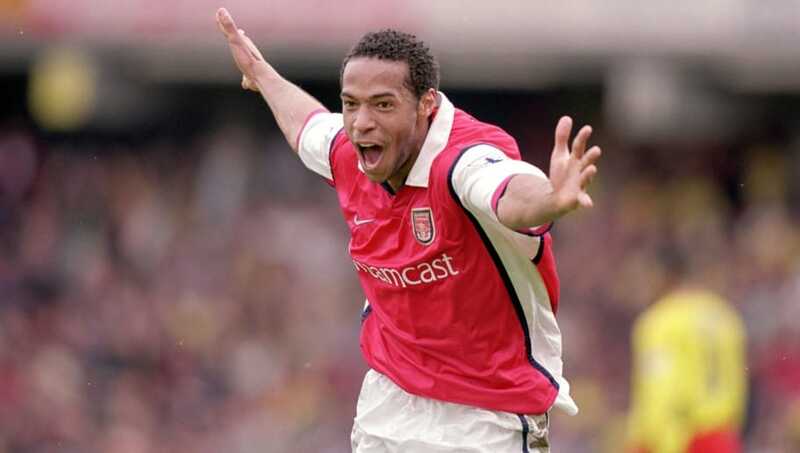 The goal would spark Arsenal into life and soon enough, Sylvain Wiltord levelled the game up at 2-2 to rescue a point. In his final season with the club, Henry scored an absolute pearler against Blackburn Rovers at Ewood Park – adding another club to the list of teams he scored crackers against. Neatly linking up with the emerging Cesc Fabregas in midfield, Henry strode down the left hand flank as he advanced into the penalty area. And then, quick as a flash, he pinged an arrow of a shot in off the underside of the bar – leaving a perplexed Brad Friedel with no chance in the Rovers goal. One of Henry’s most iconic Arsenal goals again came against Manchester United – with his celebration after scoring equally as notorious as the goal itself. Receiving the ball on the edge of United’s box, Henry seemingly had few options on again – making what he did next even more sensational. He flicked the ball up with his right foot, before swivelling to fire a dipping volley over Fabian Barthez into the corner. What came next? Bombing off to the Arsenal bench to celebrate with the ‘wasssuppppp’ phone signal – ahhhh memories. Now we get down to the business of individual brilliance. Henry was never one to shirk away from putting in a top drawer performance in north London derbies, and produced one of his most outstanding performances against Spurs at Highbury in November 2002. Furthermore, he produced one of the best individual goals the Premier League has ever seen against Glenn Hoddle’s side – breaking away from inside his own half, running at the Spurs defence with pace and imperious close control before drifting across the area to fire past Kasey Keller. A truly magnificent goal that will make highlight reels for years to come. Top dog on this rundown of Henry’s greatest ever goals takes us back to Highbury (Henry’s spiritual home if you will), and Arsenal’s clash with Liverpool in April 2004. The Frenchman was again solo master craftsman, picking the ball up by the halfway line before driving at the Liverpool defence. His balance, agility and trickery saw him glide past Steven Gerrard among others, before dumping Jamie Carragher on his backside with a lovely feint. The finishing touch was a precise low strike past Jerzy Dudek, sending Highbury wild once more. Henry would finish the game with a hat-trick as the Gunners ran out 4-2 winners in a season where he, and his teammates, proved they were ‘Invincible’.